The Delhi Capitals are coming off a big defeat at home against the Chennai Super Kings after having a fantastic start against the Mumbai Indians. The Kolkata Knight Riders on the other hand have won both their games, thanks to Andre Russell’s incredible blasts in both matches. The Delhi Capitals will look to quickly adapt to their home pitch which doesn’t exactly suit their team and come back strong. The Knight Riders on the other hand will want to win a game without Andre Russell playing a blinder to give them confidence and belief as a team going forward. The Knight Riders have had the edge over the Delhi Capitals winning 13 matches out of the 23 encounters. Delhi Capitals have won 9 matches and there was one abandoned game. At Delhi, in the 9 matches played, the Knight Riders have won 5 of those matches with 3 to the Delhi Capitals and 1 abandoned game. Shreyas Iyer, for the Delhi Capitals, has been in very good form in the Syed Mushtaq Ali trophy this year, scoring 484 runs at an average of 60.50 and a strike rate of 152.20. He has also managed to score two hundred’s in the tournament. Having missed out so far in the tournament, he will be looking to get a big score at home. Dinesh Karthik, for the Kolkata Knight Riders, will be a key player. He had a great season last year for the Knight Riders scoring 498 runs with a strike rate of 147.77. With the slow turning Delhi pitch, he is one of the batsman who can adapt to this type of a pitch and score at a brisk pace against the spinners. For the Delhi Capitals, they will look to make a few changes with Chris Morris available for the game. They might also look at getting Sandeep Lamichhane as their fourth overseas option. The Knight Riders will not be looking to make changes and will go with the same winning combination. The Delhi pitch has been on the slower side and is difficult for the batsman to get away, particularly in the second half of the game. The Knight Riders have a better balance in their team and with their record, they will start favorites. The Delhi Capitals have a team to win as well but they will need the top order to fire. 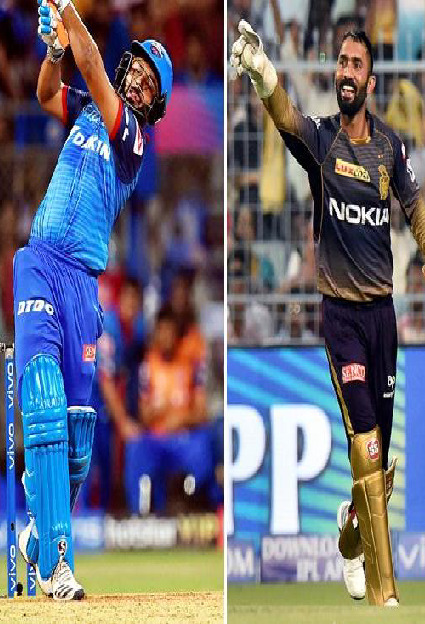 The Delhi Capitals should use to look at opening with pace bowlers from both ends which will make Narine uncomfortable and restrict the opening on slot. Russell has also struggled a bit against the leg spinners and hence on the Delhi Pitch, they will look at Amit Mishra to dismiss Russell. The Knight Riders should look to attack in the Power plays as much as possible on the Delhi Pitch. With Delhi having a long tail, they should look to attack more at the top during the bowling innings and get wickets.